Chocolate you love as much as we do. A luxury gift hamper brimful of award winners and bestsellers. Know they love good chocolate but not sure which? Want the kudos of introducing them to their new favourite? May we present a carefully curated selection of proven recipes, from mellow to dark, hot chocolate through boxes of chocolates to our Batons, designed to be the perfect way to try a grade you’re not familiar with. 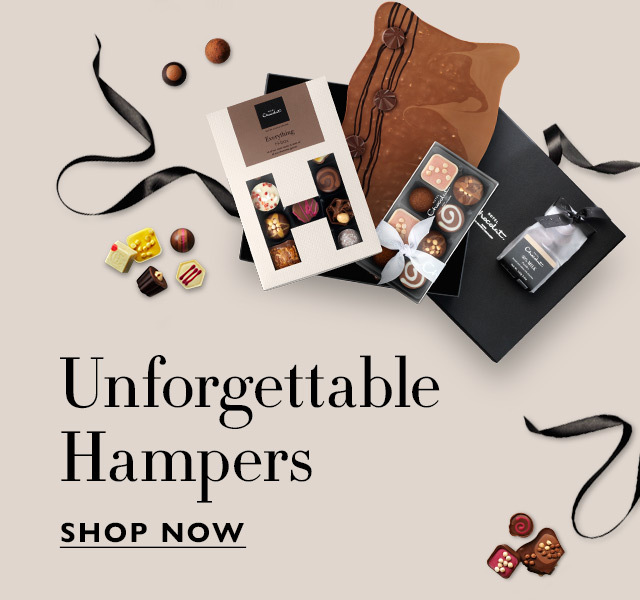 It’s all trimmed with our classically chic luxury gift hamper, tied with a ribbon – so they’ll remember the moment they discovered the best recipe they’ve tried, and thank you for it. 2,395.00 g / 84.48 oz. Ingredients: cocoa solids (cocoa butter, cocoa mass), sugar, full cream MILK powder, almond biscuits (WHEAT flour, sugar, butter (from MILK), ALMOND NUTS, cocoa mass, EGG yolk, whole EGG, raising agents (diphosphate, sodium carbonate), salt, cocoa powder, emulsifier (SOYA lecithin), acidity regulator (citric acid), flavourings, WHEAT starch), HAZELNUT paste, caramel half-salted butter (glucose fructose syrup, sweetened condensed MILK, half salted butter (from MILK), sugar, water, salt), sweetened hazelnut paste (HAZELNUTS, sugar, emulsifier (sunflower lecithin)), stabilisers (sorbitol, glycerol), skimmed MILK powder, marshmallow (glucose fructose syrup, sugar, water, gelatine, maize starch, beetroot juice powder, flavouring), butter oil (from MILK), breadsticks (WHEAT flour, palm oil, yeast, WHEAT malt flour, salt), whipping cream (cream (from MILK), stabiliser (carrageenan)), cashew nut paste (CASHEW NUTS, rapeseed oil), glucose syrup, icing sugar, florentines (ALMOND NUTS, sugar, butter (from MILK), glucose syrup, honey, cream (from MILK), HAZELNUTS), emulsifiers (SOYA lecithin, sunflower lecithin), HAZELNUTS, sticky toffee sauce (sugar, cream (from MILK), butter (from MILK), flavourings), vegetable oils (palm, rapeseed), PECAN NUT paste, runny caramel (glucose fructose syrup, sweetened condensed MILK, half salted butter (from MILK), sugar, salt, emulsifier (SOYA lecithin), water), fruit juice concentrates (raspberry, carrot), PEANUT paste, nibbed CASHEW NUTS, caramelised sugar, shortcake biscuits (wheat flour (WHEAT flour, calcium, iron, niacin, thiamin), non-hydrogenated vegetable fat (palm, shea, rapeseed), sugar, invert sugar syrup, tapioca starch, salt, raising agents (sodium bicarbonate, ammonium bicarbonate), emulsifier (sunflower lecithin)), neutral alcohol, freeze dried strawberry powder, half candied cherries (cherries, liquor, kirsch), invert sugar syrup, nibbed PECAN NUTS, amaretto, pistachio paste (PISTACHIO NUTS, rapeseed oil), WALNUT paste (WALNUTS, sunflower oil, citrus fibre, emulsifier (SOYA lecithin)), MILK fat, whole MILK powder, champagne (SULPHITES), flavourings, cocoa biscuits (wheat flour (WHEAT flour, calcium, iron, niacin, thiamin), sugar, vegetable oils (palm, rapeseed), cocoa powder, malt blend (glucose syrup, BARLEY syrup, malt extract (from BARLEY)), skimmed MILK powder, raising agents (sodium bicarbonate, tartaric acid), salt, flavouring), dextrose, sunflower oil, meringue pieces (sugar, non-hydrogenated vegetable fats (shea, palm oil), WHEAT starch, EGG white), caramelised sugar (sugar, glucose syrup), cream (from MILK), organic cocoa powder, natural colours (beetroot, paprika, annatto, carotene), desiccated coconut, ALMOND NUTS paste, cereals coated with chocolate (crisped rice (rice flour, sugar, cocoa butter, salt), sugar, cocoa mass, cocoa butter, whole MILK powder, whey powder (from MILK), butter oil (from MILK), vegetable fat (coconut), glazing agents (gum arabic), glucose syrup, modified starch (potato, maize), emulsifier (SOYA lecithin), flavouring, spices), yoghurt powder (from MILK), acidity regulator (citric acid), sea salt, concentrated whey (from MILK), cinnamon paste (glucose syrup, cinnamon, water, plain caramel, essential oil (cinnamon)), freeze dried strawberry pieces, ground cinnamon, ground nutmeg, MILK protein, vanilla seeds, acidity regulators (malic acid, citric acid), concentrate of spirulina. ALL CHOCOLATES IN THIS BOX MAY CONTAIN TRACES OF PEANUTS, TREE NUTS, MILK, SOYA, WHEAT, GLUTEN, EGG, SESAME. Caution: Although every care has been taken to remove fruit stones and nut shells, some may still remain.